I chose After 8, Ferrero Rocher and something I can't remember >_< But those 2 were absolutely delicious! Nom nom nom.. There was even a crunchy cone in the middle. Don't forget to recycle the plastics after you're done! By using this upgrade voucher, I got to buy a triple scoop (RM 10) for the price of just a double scoop (RM 8). 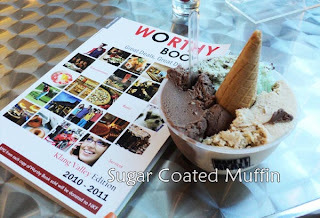 There are 5 of this voucher in the book so you can save RM 10 total here xD For an ice cream lover like me, this is good! From your total savings, you can buy another triple scoop cup! I was a little annoyed as the guy didn't understand me when I asked him if he accepted the Worthy Book voucher. Always ask before purchasing. He looked like he hadn't even heard of the book before o_O Sensing something was wrong, the other guy who was older came to assist me and he explained the usage of the voucher to me like the price, size of the triple scoop etc. Overall, I'm quite happy with my experience ^^ Although I had to squeeze through the crowd from Curve to Cineleisure then back to Curve again. But it was worth it for ice cream!! mmhmmm that looks delicious! Ive never heard of Worthy Book but it sounds awesome!